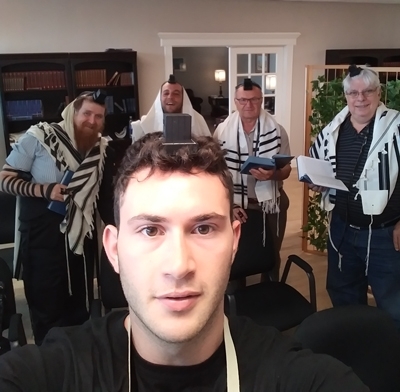 Our first for the season "Wrap Stars Tefillin & Breakfast" on Sunday mornings got off to a great start! Come and join us this Sunday at 9 AM! No Tefillin? No problem. We've got a pair for you and help you with putting it on. Followed by a delicious breakfast prepared by the guys. JKids in Action will be getting together on Sunday, May 28, 2:00 to 3:30 pm, for a fun pre-Shavuot meet! Make your own Candy Torah Scroll! Go on a guided tour of a synagogue, see the Torah scroll up front and learn how a Torah is made! 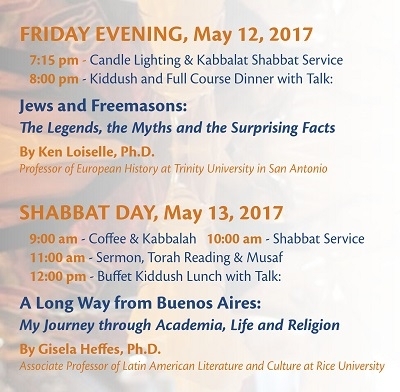 Join us for the annual Shavuot Celebration! The Kiddush is dedicated in honor of Mrs. Fern Goodstein's Birthday! To many more healthy and happy years! This Shavuot we are honored to be hosting Rabbi Dr. Shmulie Margolin and family! 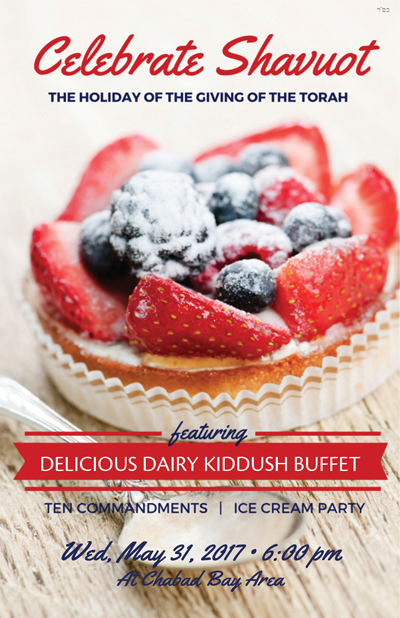 Followed by Delicious Dairy Kiddush Buffet, including, delectable homemade cheesecakes, salads, pasta dishes, blintzes, an ice cream bar and more! As the 2nd of the trilogy of biblical festivals (Passover, Shavuot and Sukkot), Shavuot commemorates one of the most pivotal events in world history: The giving of the Torah at Mount Sinai. A highlight of Shavuot is the traditional reading of the Ten Commandments. It is also customary to eat dairy foods on Shavuot, as well as to stay up studying Torah on the first night of the holiday. Lunch - Free (optional RSVP by replying to this email). 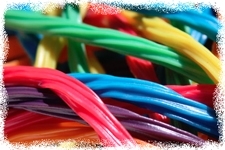 JLI Course - Not too late to join in! The new JLI course, Survival of a Nation, was off to a great start this past Tuesday. It is not too late to join, come join us for the 2nd lesson this Tuesday, May 9 at 7:30 pm. Survival of a Nation presents the Six-Day War as you’ve never experienced it before. What answers can we find in the timeless sources of Torah and milenia of Jewish wisdom? Register Online | More info & registration: www.myJLI.com.